A Safety Inspection is a formalized and properly documented process of identifying hazards in the workplace and comes in all different forms depending on the environment being tested, but they generally compare results against acceptable standards to ensure that a given environment falls within acceptable safety limits. This form allows you to record the safety inspection done in the site. 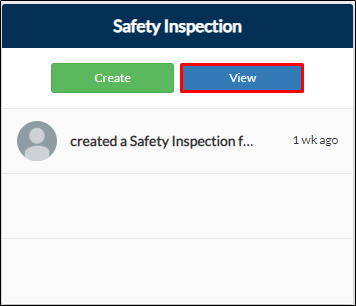 From your project page, go to Risk Management tab > View on Safety Inspection tile. From your projects dashboard, go to the Reports button. Locate the Safety Inspection Report then click View Report. This can be found under All or Risk Management tab. 2. You will be redirected to Safety Inspection Report page where you can view all the submissions. 5. Click Save. Your updated submission will now be called V2 if you updated the V1 of your submission.